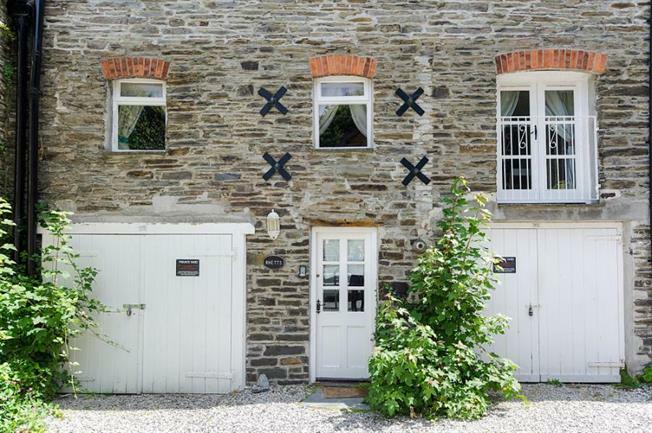 2 Bedroom Terraced Cottage For Sale in Cornwall for Guide Price £485,000. Converted Part Of Mill Bursting With Character, In Old Town With Garage & Parking! A rare opportunity to purchase this period conversion with parking in the heart of Padstow old town. The property offers two bedrooms, master en-suite and an open plan lounge/diner/kitchen, with double doors and a Juliet balcony on the first floor, a shower room and an entrance lobby/seating area on the ground floor. Outside there is the added benefit of a garage with parking for one car inside, plus most of the enclosed yard. The property enjoys a gated setting within a terrace of similar properties just yards from the town centre and harbour. Padstow is a harbour town nestled on the rugged north Cornish coastline famed for its quaint streets, cute cottages, restaurants and water sports facilities. From here the Camel Trail runs along side the Camel Estuary to the market town of Wadebridge onto Bodmin. Padstow offers a range of amenities including banks, post office, dentist, library, doctors, school, supermarket and an array of shops and restaurants. For further facilities Wadebridge is within seven miles. There is a bus service from Padstow which runs to Newquay and Truro amongst other destinations and Newquay airport is within eleven miles. Early viewing highly recommended. Door gaining access to ground floor shower room. Built in cloaks cupboard housing central heating boiler. Stairs rising to first floor with cupboard underneath. Two radiators. Tiled floor. Beamed ceiling. Built in shower cubicle with mixer shower. Semi pedestal wash hand basin with mirror, light and shaver point over. WC. Recessed shelving, extractor fan. Part tiled walls. Tiled floor. Doors gaining access to bedrooms and lounge/diner/kitchen. Built in shower cubicle with mixer shower and tiled surround. WC. Vanity wash hand basin with tiled surround. Part tiled walls. Extractor fan. Mirror with light and shaver point over. Recessed shelving. Window to front with deep sill. Radiator. Wooden floor. Two wall lights. Window with deep sill to front. Pair of glazed double doors with Juliet balcony to front. Television point. Radiator. Wood flooring. Four wall lights. Feature exposed stone wall. Space for dining table and chairs. Open plan to lounge/diner. A range of wood fronted base and drawer units with roll top work surfaces with inset stainless steel four ring gas hob and built in electric oven underneath, extractor over. Recessed shelf with tiled surround amongst feature exposed stone wall. Integrated under counter fridge-freezer. Integrated dishwasher. Breakfast bar with cupboard underneath on one side and space for stools on the other side. Glazed wall unit above. Wooden floor. Inset stainless steel sink and drainer with mixer tap over. To the right hand side of the front door there is a single garage with parking inside for one car. For sale with the property is part of the yard giving futher parking areas. To the rear of the garage. Part of the yard to the frontage of the garage is being sold with this property.